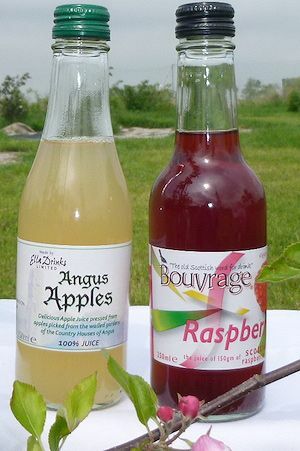 Producers of Bouvrage raspberry juice, Angus Apples apple juice and Berried diluted fruit drinks. Launched in 1998 at the Royal Highland Show, Bouvrage is an all-natural range of award-winning berry juice drinks. The strawberry and raspberries used are Scottish, while the blaeberries come from Finland. The slightly sparkling raspberry drink contains a whole pound of berries in every 750ml bottle. Their juice isn't just good because there is no added sugar but also because the berries have anti-bacterial medicinal qualities that are meant to help alleviate stress. They recently started producing Angus Apples, a drink made from Scottish apples from their orchard and elsewhere around Angus.